Armed Churchgoers In NEW JERSEY? When Hell Freezes Over! A Republican state lawmaker wants to make sure all New Jersey churches, synagogues, and mosques have someone with a gun on hand to protect congregants. Assemblyman Ron Dancer, R-Monmouth, has introduced legislation that would allow the state's places of worship to select a "qualified person" to carry a concealed handgun during services. "Especially in this era, places of worship are a terrorist target," Dancer told NJ Advance Media on Thursday. "These are worshippers. They're praying. They're totally defenseless." Whether the bill will get far in the Democratic-controlled state Legislature is another story. Now that Chris Christie has been retired, the new Democratic Governor Phil Murphy is busy undermining all of Christie's more 'lenient' Gun Control decisions. Throughout former Gov. Chris Christie's tenure the state Legislature was controlled by Democrats. But over eight years, they were never able to mount a veto override, allowing the Republican governor to kill bills strengthening gun control, funding family planning services and and raising the minimum wage. But with a new governor, one who's vowed to sign every gun bill that hits his desk and signed an equal pay executive order within hours of taking office, many of those bills are expected to resurface with different results this time around. Starting Monday, the Legislature will revisit bills felled by Christie's veto pen, including those that would have the state rejoin the Regional Greenhouse Gas Initiative and restore funding for family planning services. This may be the Opening Round of Republican vs Democratic 2nd Amendment controversy under the (Democratic) Murphy Regime. As strange as it sounds, New Jersey-ites who support the Second Amendment have been "spoiled" by the former governor. We can always expect from Salon (and her friends) the least reasonable interpretation of "Cause and Effect": she thinks that firearms violence stems from the "Right to Carry" laws ... which encourages law-abiding citizens to exercise their right to carry a firearm. And she thinks that this is a HUGE surprise problem? One of the most contentious arguments within the larger gun control debate is over whether right-to-carry laws that make it legal for gun owners to carry loaded weapons in public, usually concealed on their person, make people safer. Gun rights advocates argue that packing heat is a prevention against crime and violence, invoking slogans like, "An armed society is a polite society." Gun control proponents, however, argue that a proliferation of loaded weapons is bound to lead to more violence, if only because people have easier access to the means to harm others. Salon (and I speak of her as a person, for the sake of discussion) assumes that the proliferation of armed citizens is a factor in firearms violence. I think she's an illiterate dork who doesn't understand the problems of inner-cities violence, where only the strong survive. Okay ... the most aggressive survive. The fact is that people who legally carry a firearm (CHL, or "Concealed Handgun Licensees") are NOT the progenitors of violence; they are, however, the persons who may be on the scene to counter illegal firearms aggression .... and they may be "there" before the police (who are often less-well trained than the CHL) arrive. People who don't know about guns raise the question that, when cops show up at the scene of the shooting, they don't know which person with a gun is the "bad guy", and may end up shooting the "good guy". This isn't a problem; the Good Guy is the one who lays down his firearm as soon as legitimate authority arrives. The good guys don't feel that they are the equivalent of the police; they just feel like the guy who plays his garden hose on a house fire until the firemen show up. They're the Good Neighbor; they don't start the violence, they just want to stop it! They are more than willing to yield the scene to (tardy) legitimate Law Enforcement Officers. Good Neighbors just want all the 'bad stuff' to STOP! Salon, and her friends who assume the worst of honest citizens, offer the suggestion that armed citizens are "A Problem". Good citizens care about their family, their friends and their neighbors. The fact that they have made the exceedingly difficult decision to arm themselves isn't an indication that they are eager to shoot people; it just means that they have accepted the responsibility to protect themselves, their family, and (under the worst circumstances) their neighbors. They may not even like their neighbors ... but are they still willing and able to protect them under the worst circumstances possible? Think about it; do you like your neighbors enough to risk your life to save them? how comfortable are you when you decide to denigrate your neighbor because he or she is willing to lay down his or her life to protect your family? The gun industry is holding its biggest annual trade show this week just a few miles from the site where a gunman slaughtered 58 concertgoers outside his high-rise Las Vegas hotel room in October using a display case worth of weapons, many fitted with bump stocks that enabled them to mimic fully automatic fire. Gun control advocates, meanwhile, pointed to the irony of the location and planned a protest to renew calls for tighter gun sale regulations, including expanded background checks. Vegas has been the site of firearms trade shows for decades ... for the sponsors of the show to change the venue at the last minute because of the recent massacre by a crazed man would generate even more press, and at the same time validate the insane political statement (whatever it was) he gave his life to make. To cancel the show would have the same effect. But to continue with the planned schedule and venue sent the message that firearms were not the issue in his maniacal massacre; any effort to depict the private ownership of firearms in a negative light was ignored as not being worth the effort. The Second Amendment stands on its own, even when the rights acknowledged are abuse by maniacs. The National Rifle Association influences politicians by spending $14 MILLIONS in political contributions! The National Rifle Association ("NRA") is 'accused' of contributing (according to "Open Secrets") a LOT of money to "Private Interests". All of this money, of course, is invested by the contributions and membership dues of the NRA. When people talk about money in politics, they often point to the money that a candidate receives from a special interest (regardless of the amount of that contribution) as evidence of undue influence. Nowhere is this more true than with the National Rifle Association. .... The NRA, according to OpenSecrets.org, has contributed about $593,000 in 2016, almost entirely to Republicans. And while contributions certainly tell part of the story, it is the NRA’s big campaign spending that makes up most of its influence: The group’s two political arms, the NRA Institute for Legal Action and the NRA Political Victory Fund, have spent $14.5 million opposing and supporting federal candidates, according to an analysis of Federal Election Commission data by the Sunlight Foundation. Hmmm ... so people who support the Second Amendment of the United States Contribution are willing to contribute (in membership fees, and voluntary contributions), to defend your constitutional rights? And this is "A Bad Thing"? Don't Americans have the right to give money to institutions which support their Constitution? If so ... why should they be publically castigated. when more frivolous issues are supported with no comment at all? WETA: "Washington's source for compelling television and inspiring classical music"
Founded in 1961, WETA (The Greater Washington Educational Telecommunications Association) is the leading public broadcasting station in the nation's capital, serving Virginia, Maryland and the District of Columbia with educational, cultural, news and public affairs programs and services. WETA's mission is to produce and broadcast programs of intellectual integrity and cultural merit that recognize viewers' and listeners' intelligence, curiosity and interest in the world around them. So we are willing to accept the societal expenditure of $46M to save puppies, and $136M for "compelling television and inspiring classical music", but we are unwilling to accept the societal expenditure of $14M to protect our constitutional rights? Oh ... and that fourteen million dollars contributed to the NRA is privately donated ... voluntarily, by the participants. But the puppy-fund and the television funds are ... you guessed it ... supported by your tax dollars. You don't get to choose; it's federal! Don't you sometimes wish that you had the option of deciding which cause your tax dollars went to? Wouldn't you rather contribute to the Society for Maintenance of Ethnic Russian/Siberian Huskies (SMERSH) than the Preservation of Urasian French Female Siberians (PUFFS)? I'm telling you ... this society is going to the dogs! One gun a month, three guns a month , 20 guns a month ... who are they to determine what is the "correct number" of guns should be appropriate for someone to exercise their Second Amendment Rights? “When people roll up to New York and they laughing at how many guns they were able to collect in Richmond, that should be a problem for everyone. And to think those guns are all going in the hands of legal, law-abiding citizens, that's laughable, because you know it's not," he said. "We need the General Assembly to step up." "Legal, law-abiding citizens? What's the problem here? Is it in your stars, or in your selves? What? Are they embarrassed because someone is "laughing about how many guns they were able to collect"? How DARE they (Virginia Legislature) assume that the number of guns a month purchased should be considered an indicator of probity? The measure is one that both former Governor Doug Wilder and Richmond Mayor Levar Stoney have called for reinstating. “There’s no reason that a person needs to have more than 12 guns in a year to go purchase. I think that’s just something that's common sense that needs to be brought back, it’s practical,” said Mayor Stoney. If it were the First Amendment issue, they are liable to being stoned by their constituents for their obvious willingness to restrict their constitutional right; everybody like to shoot their mouth off,. But a "Second Amendment issue" is different; not "everybody" likes to own guns, so it's an easy target. (forgive the pun) Not everybody is eager to shoot their guns off. In contrast; how many statements in opposition to their opinions are to be legally allowable, and who may chose which statements (guns?) are permissible? Who are they to decree what is the "Practical" number of guns a law-abiding citizen should purchase? Are they merely embarrassed by "people who roll up to New York" and "laughing at how many guns the were able to collect in Richmond"? Are Virginia legislators more concerned about their "image" than their service to their constituents? Or is this something more personal? Is Virginia all that eager to obviate the Second Amendment Rights of its' citizens? (Hard to believer, from one of the original 13 colonies!" "the fault, dear brutus is not in our stars, but in our selves that we are underlinings"
Firearms Safety Classes: Teaching "Beginners"
It surprises me to learn that some people dismiss the challenge of teaching "Beginning Shooter" classes. ... teaching beginners is the most dangerous and difficult task any shooting instructor ever faces. And yet we tend to look down on people who teach such classes. Even instructors sometimes look down on themselves for not teaching ‘real’ classes. I've been teaching "advanced" classes for eight years, and I have never volunteered to teach "Beginners" because I'm a big coward. Sometimes, though, it's impossible to avoid that challenge; this is especially true when beginners over-value their gun-handling skills because of ignorance, or bad habits which can be developed because they have become accustomed to handling guns without proper supervision. Because they over-rate their gun-handling skills, they often sign up for "advanced" courses ... and they show up at one of my "Introduction to USPSA" classes because they expect me to teach them the advanced techniques of skills they haven't already developed for themselves. Ultimately, though, no matter how "experienced" the student population may seem to be ... we are all "beginners" when it comes to learning new techniques ... such as drawing from a holster, and competing under the pressure-cooker of a limited amount of time to competitively complete a course of fire. This is the purpose of the first hour of an "Introduction to USPSA" class which I teach monthly; it is designed to identify and correct "bad" gun-handling practices. Even though I'm careful to confirm that my students are experienced ...(and during the first hour ... the "Lecture" hour ... of a class, I ask each student to describe his/her experience with his pistol,, with competitive shooting and simply "Drawing From The Holster") ... I am still surprised by the occasional student who seems "Unclear On The Concept". This class was originally envisioned as an "Advanced Course"; designed to hone skills which have already been learned and practiced, but not to the level of achievement needed to compete successfully. Over the six or seven years I've been teaching it, the course has been modified to teach competent, experienced pistol shooters to compete in a narrow range of gun-handling skills specifically tailored for competition. Unfortunately, it has been interpreted by prospective students as a class which would teach only 'advanced' (slightly) 'gun-handling skills' for people who have never learned to draw from the holster and engage a myriad of targets. Well .. that's okay by me. I can do that. In fact, I think it's a better use of my time, because the people who already compete in USPSA classes probably already think they know everything they need to know, and this class may serve to introduce new competitors to the sport. But I don't willingly teach "beginner" students; still, from time to time I find myself confronted by students who are unfamiliar with the controls of his/her firearm ("oh, this gun doesn't have a safety") or who do not know how to safely draw and re-holster a firearm, or whose grip is unsafe. Even so, the class still serves several useful purposes. 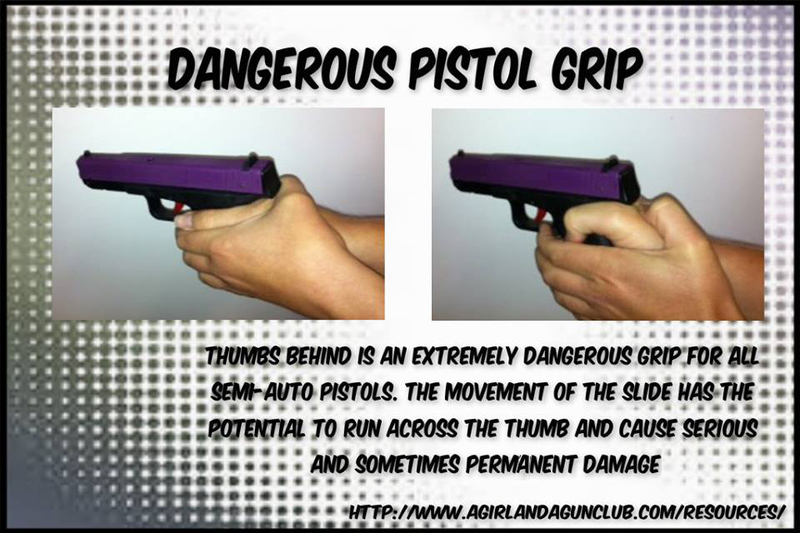 Every year I have to correct the grip of at least one unsafe student who practices the "Left Thumb Over The Right Wrist" grip, because he/she is unaware that the slide on a semi-automatic pistol WILL recoil and chew their support-hand thumb! I suspect that these people are accustomed to shooting revolvers, in which practice it is a viable technique to manage recoil. 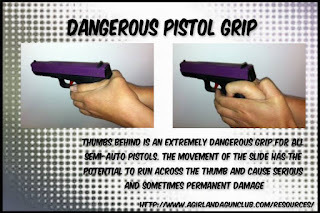 However, when shooting semi-automatic pistols, gripping your pistol so that your thumb is in the way of the slide-recoil is a Bad Habit because if you put your thumb in the path of a recoiling slide, you may need to spend an uncomfortable period of time learning to shoot a semi-automatic pistol without benefit of the supporting thumb. That recoiling slide will at least break your thumb; and that is the BEST outcome you should expect. So keep your thumb along the side of the grip, and you won't be hiring a surgeon to replace your thumb with your big toe. No, I'm not kidding about this. The Student cannot find his safety without looking, or does not automatically "safe" his pistol when holstering. This should not be part of an advanced course, but it is still important. The student, when responding to commands or instruction when holding his/her pistol, pivots his/her body in such a manner as to point his/her pistol at the instructor when receiving instructions. I'd rather this student learn from a different instructor; I get nervous when people point guns at me! Even though I invariably announce that the ("New Shooter") class will be taught using USPSA rules of gun handling, I still see students wandering around the shooting bay with a pistol in their hand, usually with the purpose of asking me a question about some semi-obscure nuance of gun-handling practices. Perhaps I need to loudly announce: "STARTING NOW! to emphasize the onset of strict firearm safety practices on the range. One would expect that intelligent firearms owners would understand immediately, but they have been desensitized by years of casual firearms-handling practices. They do not realize that the rules of safe gun-handling are in effect ANY time you are shooting. Even in the company of close friends (who are willing to forgive you if you are an unsafe dork). If you are in my class, and you break tis basic rule of Firearms Safety ... I won't forgive you. In fact, I'll yell at you. With any luck, I'll embarrass you in front of your friends; perhaps I'll convince you that you should never carry a gun. Then you need to convince me (and yourself) that you are Competent. That's the best possible outcome of a training session.